The dynamics of Hodgkin and Huxley neuron for simple injected current waveforms such as steps and ramps has been extensively investigated in the literature . A non-linear perturbation analysis showed that a Hodgkin-Huxley neuron with deterministic gating variables is I/O equivalent with a project-integrate-and-fire (PIF) neuron with a variable threshold sequence . The PIF neuron integrates a projection of the stimulus onto the phase response curve that is, in turn, modulated by a phase shift process. 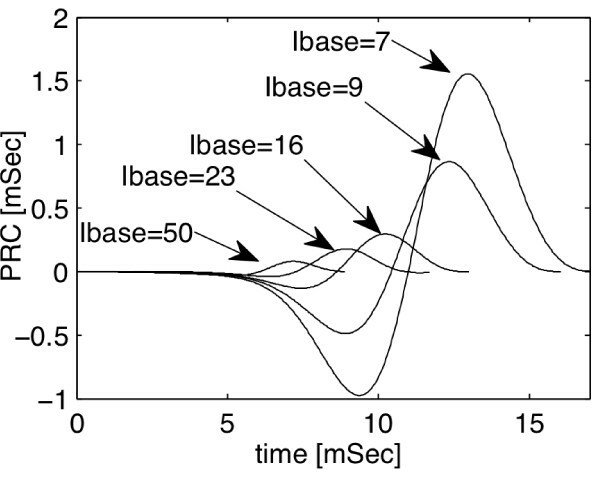 The phase shift process is described by a differential equation that is stimulus driven. In the absence of the small perturbation term, the stimulus is tangentially coupled into the limit cycle of the Hodgkin-Huxely neuron and the PIF neuron reduces to an integrate-and-fire neuron. Based on the I/O equivalent PIF neuron a stimulus recovery algorithm was given in . The recovery works well provided that the stimulus restricts the PRC to a small parameter set. 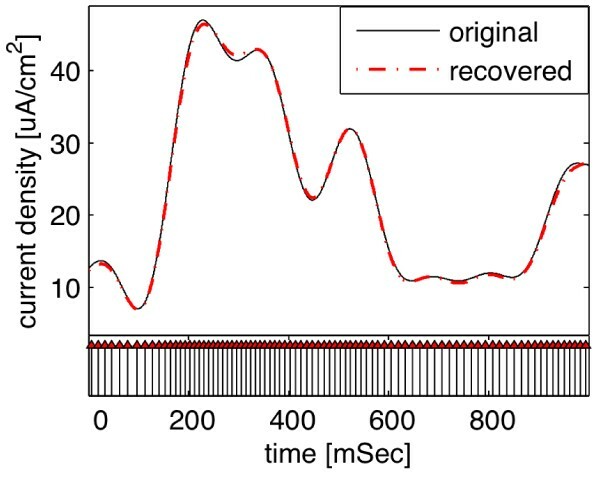 If, however, the Hodgkin-Huxley sweeps across a broad set of Phase Response Curves (PRCs as in Figure 1), a different recovery algorithm is needed for improved performance. PRCs with different base current (Ibase). The key limitation of the recovery algorithm in  is due to the static nature of the PRC. By introducing an adaptive kernel, the PIF can provide a faithful I/O description of the Hodgkin-Huxley neuron. In order to achieve an accurate I/O description, the PIF is endowed with an integration kernel that is inter-spike dependent. The kernel is, in effect, a conditional PRC that is parameterized by the inter-spike interval. Using the PIF with conditional kernel, our recovery algorithm was extensively tested for randomly generated stimuli. An example is shown in Figure 2. The normalized recovery error was between -20 dB and -40 dB. Recovery of input (top) from a spike train (bottom). The original input is constructed with 20 Hz bandwidth. The proposed algorithm is very flexible; it only requires the inversion of a matrix. It can be used for the recovery of stimuli encoded by a large class of neurons in the limit cycle region. It remains an open problem how the dendritic tree of a postsynaptic neuron is capable of recovering the information from its incoming spike sequence. The work presented here was supported in part by NIH under grant number R01 DC008701-01 and in part by NSF under grant number CCF-06-35252.